Darjeeling BJP candidate Raju Bista filed his nomination on Tuesday and, in a balancing act, spoke about “development” for the plains and “pride” for the hills. 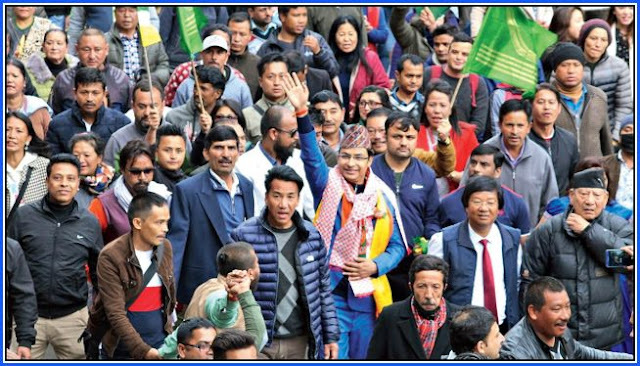 The stance of Bista — who is being supported by the Gorkha National Liberation Front (GNLF) and the Bimal Gurung faction of the Gorkha Janmukti Morcha — mirrored that of Amar Singh Rai, the nominee of the Trinamul and Gorkha Janmukti Morcha’s Binay Tamang group. Observers believe the similar narrative reflects the “reality” of all parties eyeing the seat. The Lok Sabha constituency consists of three Assembly hill seats and four Assembly seats in the plains, with more voters in the plains. Bista was accompanied by hundreds of supporters to his nomination on Tuesday. Rai’s filing on Monday was accompanied by a similar show of strength. “Development is our first agenda. On this agenda, we cannot leave out Bengal as it lags the rest of the country. Apart from this, the hills have their strong old issues and to solve these issues, I will work sincerely,” Bista said in response to questions. He stressed that he was “the son of a Gorkha”, appearing to invoke hill pride and addressing criticism that the BJP had foisted an “outsider” on the seat. “I will assure that no Gorkha will have to lower his head because of me,” said the 33-year-old Delhi-based entrepreneur who traces his roots to Manipur. The Morcha’s Tamang’ camp also highlighting the key question of identity, besides issues such as land rights for dwellers of tea gardens, cinchona plantations and other hill people — without uttering the Gorkhaland word. However, some other hill-based parties, such as the CPRM and the JAP, and some independents candidates from Darjeeling are raising the Gorkhaland issue. Tamang has often said that nearly 87 per cent of the hill people do not have land rights and that this would be the party’s primary focus, apart from an old demand to review of Indo-Nepal Friendship Treaty, 1950, to ensure that “there is a clear demarcation of Nepalese citizens and the Indian Gorkhas”.